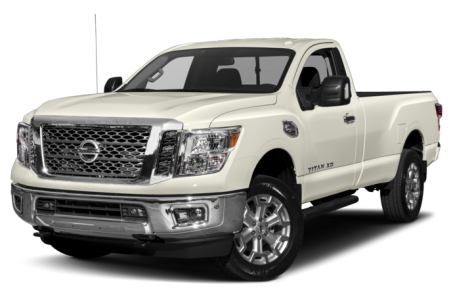 The 2018 Nissan Titan XD is a heavy-duty truck that competes with the Ford F-Series, GMC Sierra, and Chevrolet Silverado. The Titan XD is available in five different trim levels: S, SV, PRO-4X, SL, and Platinum Reserve. It has two configurations: a single cab and a crew cab. Under the hood, the Titan XD is powered by a new, standard 390-hp, 5.6-liter Endurance V-8 engine mated to a 6-speed automatic transmission that produces 394 pounds-feet of torque. The 311-hp, twin-turbo-diesel 5.6-liter Cummins V-8 engine coupled with a 6-speed automatic transmission is still available as well. The truck can come with either rear-wheel drive or part-time, four-wheel drive.